Chanteur Country US né en 1919 à Bartonville (Illinois). Mac McGuire est décédé le 2 Janvier 1963. 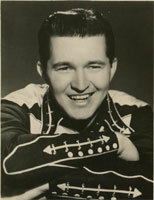 Born in 1919 in Bartonville, Illinois, MacMcGuire became a multi-talented entertainer, seemingly about 1920. His first radio experience was with a station in Nebraska they wrote in a 1951 article. He did solo shows in Illinois and North Dakota. After those stints, he traveled extensively, with New Jersey and Michigan being popular on his itinerary. He also wrote and produced several shows on the Mutual network, but no mention of these shows was found. He moved to WCAU in Philadelphia in 1943, a stay which lasted three years. From there, he moved to radio staion WIP where he became a popular music disc jockey. But all the while, western music remained a hobby for him. 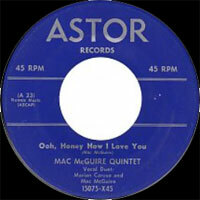 In fact, he was part of the Harmony Rangers Quintet that was quite popular back East. On WIP, his shows were on Monday through Saturday from 7:00 to 9:00 (they didn't say whether it was a morning or evening show) and also did a 3:00 to 4:30pm show Monday through Friday. Mac also did some solo recording work for the Capitol label. 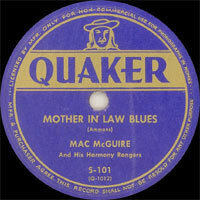 08/1946 78 t. QUAKER S-101 (US) Mac McGUIRE & His HARMONY RANGERS - Mother In Law Blues / ?